When the news broke of the passing of Hon. 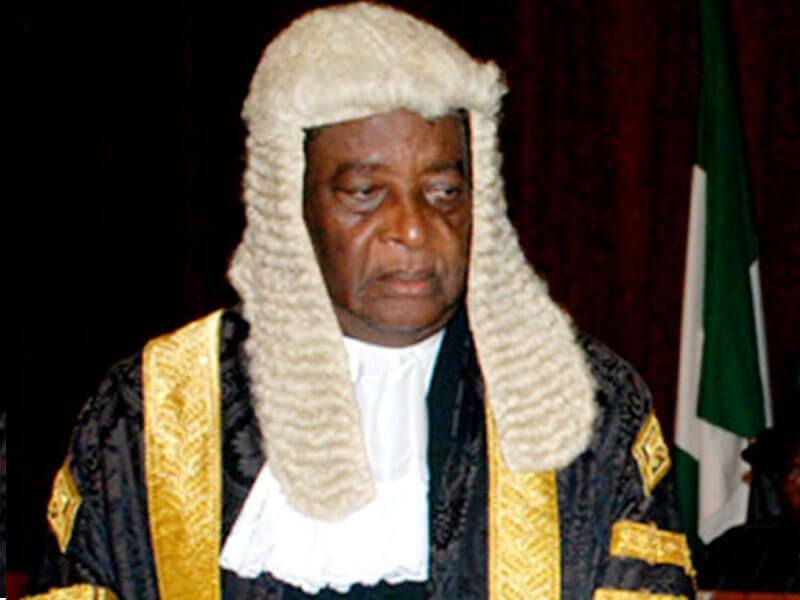 Justice Aloysius Katsina – Alu (Former Chief Justice of Nigeria) on 18th July, 2018, it was obvious to me that our nation has lost a great jurist, a personable personality, and a judicial reformer. His ever calm demeanour, disarming smile and patrician good looks, belied the fact that he had a military background. He never betrayed his emotions, but allowed his soft spoken words to convey his message, which often was laden with coherent logical postulations. He was a Judge who dominated and controlled his court. Even at that, he was courteous, friendly, firm, courageous and had mastery of the subject-matter. No one who appeared before him was ever in doubt of his robust intellect, profound knowledge of the law, penetrating logic, command of English language, and his sense of humour. His judgements were no less profound, and many can attest to his strict adherence to the tenets of justice and rule of law. My close contact with my lord, Hon. Justice Aloysius Katsina-Alu began in 2009, shortly after my appointment as Director General of Nigerian Institute of Advanced Legal Studies in May 2009. He was the Chairman of the Governing Council of the Institute until his appointment on the 30th of December, 2009 as the Chief Justice of Nigeria. As is customary of the Institute, we usually propose and research on a theme relevant to a sitting Chief Justice of Nigeria, and dedicate the output to him or her. In the case of Hon. Justice Aloysius Iyorgyer Katsina-Alu, the theme was Administration of Justice and Good Governance in Nigeria (Essays in honour of Hon. Justice A.I. Katsina – Alu, GCON, Chief Justice of Nigeria). In my preface to the book, I wrote as follows; “This book is a tribute to the Honourable Justice Aloysius Iyorgyer Katsina-Alu, GCON, FNIALS, the Chief Justice of Nigeria, who whilst he was Chairman of the Institute’s Governing Council, displayed fatherly support and unalloyed commitment to the progress of the Institute. Although relatively short, his stint as head of the Nigerian Judiciary, witnessed landmark developments in law and the administration of justice. During his stewardship Hon. Justice KatsinaAlu brought to bear a wealth of experience and commitment to service”. I recount with gratitude and deep sense of nostalgia, the support he gave to me as Director General to invite the Hon. Justice P. Bagwatti, former Chief Justice of India, to Visit Nigeria on April 21st, 2010 and address Justices of the Supreme Court of Nigeria on how India through the instrumentality of the law, made the equivalent of Chapter two (2) of our 1999 Constitution justiciable and enforceable. Hon. Justice P. Bagwatti till date is the first and only person to be inducted to the HALL OF FAME of Nigeria Institute of Advanced Legal Studies. It is common knowledge that Hon. Justice Katsina–Alu’s tenure as Chief Justice of Nigeria, was blighted by controversies that I am not competent to comment upon. What is however, instructive, is the way and manner he rode the storm, during and after his tenure as Chief Justice of Nigeria. It must be said that he preserved the dignity of the office of Chief Justice of Nigeria, even more out of office than in office. For me, that is a mark of character and nobility. He kept a respectable distance, and refused to engage or swim in the mud thrown at him. He was far from the maddening crowd, never descended into the arena, and was never willing to dance naked in the market square. In so doing, he did not compromise the office of the Chief Justice of Nigeria – thus preserving the sanctity of that office for his successors. It is now for history to judge whether or not, he was right or wrong in his actions and conducts. In all, I believe that history will be kind to him. Hon. Justice Aloysius Iyorgyer Katsina-Alu, now belongs to the ages and the pantheon of legends of our legal profession. His memory lingers on, and his judgements will continue to speak to us for a very long time. As all humans, he was certainly not infallible, but his contributions to the growth and development of law in this country, is second to none. He will be sorely missed.